While speculation is rife among major political parties on possible electoral alliances, trends indicate that the country has never produced a successful pre-or post-electoral alliance since multiparty democracy. As time ticks towards the May 21 Tripartite Elections, there is talk that all the country’s major political parties are engaged in discussions for possible electoral alliances to consolidate votes and form the next government. Our findings indicate that the governing Democratic Progressive Party (DPP), United Democratic Front (UDF), People’s Party (PP) and Malawi Congress Party (MCP) are either talking or have been doing so at individual as well as party level. These talks are happening despite the continued scorns the parties are throwing at each other during rallies as their leaders are criss-crossing the country to sell their agendas to the electorate. But with just four months left before the polls, some politicians, political analysts and observers argue that nothing tangible will emerge from the talks and, even after May 21, the situation will remain the same unless political parties begin to put together a formula for sustained alliances. Political parties have been making electoral alliances since the onset of multiparty democracy but much as this may be the case, the alliances have not yielded the ultimate prize. The first noticeable alliance was in 1994 between UDF and Alliance for Democracy (Aford) but it fell through despite the latter’s leader, Chakufwa Chihana, being given the position of Second Vice-President. Aford ditched the UDF after being in government for 19 months and partnered with MCP during the 1999 General Elections. But the alliance failed to dislodge the UDF government. In 2004, several political parties formed Mgwirizano Coalition which was led by Gwanda Chakuamba. But despite its popularity the opposition alliance came third after winning 27 out of the 193 parliamentary seats. After failing to reclaim its authority in three elections, MCP forged an alliance with UDF in the 2009 polls. This was after the latter’s leader Bakili Muluzi was barred from contesting as president having served two consecutive terms. Again the alliance failed to wrest power from the DPP under Bingu wa Mutharika and his vice-president Joyce Banda as his vice-president. The 2014 elections did not produce any alliance involving major political parties save for Tisinthe Alliance comprising minority parties led by George Nnesa, president of Mafunde. It came eighth out of 12 competing parties. In an interview this week, Aford president Enock Chihana observed that electoral alliances have not been effective because there is too much focus on the presidency other than shared governance principles. Except in the 1994 elections, Aford has always contested with a partner. “The other downside of the issue is that these alliances are usually concretised at the eleventh hour. For instance, we are a few months before the polls and all we hear about alliances are just rumours. “When a problem emerges within the leadership of the alliances, it is a challenge to fix them. So most of them end up being mere alliances of convenience,” he observed. In separate interviews this week, almost all the country’s major political parties claimed there were several ‘unofficial’ side talks on possible electoral alliances. “Our position remains that we are flexible for any electoral alliance as long as the parties willing to be together have the same agenda with us but we cannot say who we have talked to or we are talking to. “However, we are holding our national executive committee [NEC] meeting on Tuesday next week in Zomba where the issue is likely to be debated,” said PP spokesperson Ackson Kalaile Banda. As for UDF, its spokesperson Ken Ndanga said they were not planning to work with any other party and the fact that the party has collected presidential nomination forms signifies it is prepared to go alone. “We have not gone to any political party to ask them to work with us. There have been instances where individuals have approached us and discussed with us for a working relationship but that cannot be described as a discussion on an electoral alliance,” he said. 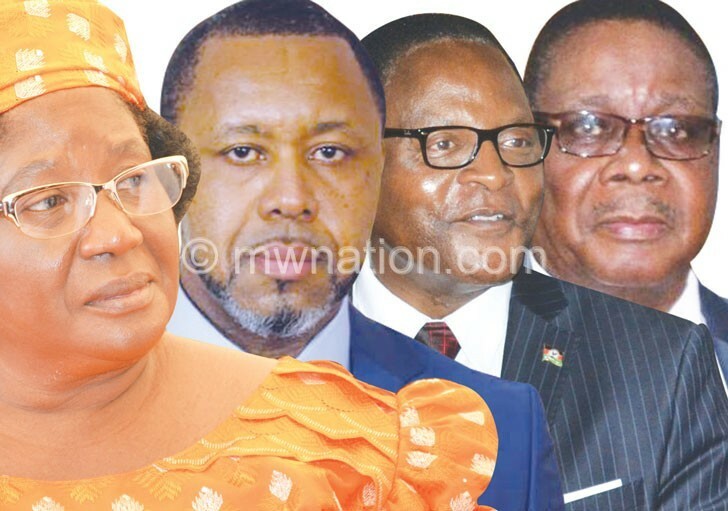 A paper, titled Political Economy: Determinants of Economic Growth in Malawi, authored by Jonathan Said and Khwima Singini in October 2014 after the country’s first tripartite elections, observes that party leaders manage a system of patronage and compete with each other for their clientelist base. It reads: “Parties are weak and morph one into another, while a small class of political elite changes parties to stay in power. Parties are made up of factions of patron-client relationships and this explains the tendency for them to splinter. But a University of Malawi (Unima) political science analyst Michael Jana observed that regardless of political dynamics and differences in the political terrain, factors that determine a workable and an impossible electoral alliance remain the same. He said talks for electoral alliances on both sides—the ruling party camp and the opposition camp—have been rife but what matters, in his opinion are, are factors that will bring formulas for effective alliances. “These are, level of current party popularity, regional voting pattern consideration, and party or alliance capacity to maintain and better still increase the support base as we approach the election day,” he said. Jana said, ideally, a successful alliance formula must be the one that includes popular parties that capture significant votes in at least two regions and reasonable inroads in the third region. “The opposition alliances in the past elections failed because the alliances mean compromises and some voters cannot take compromises,” he said. Another University of Malawi political scientist Mustapha Hussein said, in his opinion, alliances are never effective because they are not based on ideologies. “Lack of ideological base which binds the party alliances translates into weak alliances. That is why parties in an alliance are in essence a simple association of convenience for that particular time,” he said. The post So much noise about nothing appeared first on The Nation Online.